When it comes to food I'm on team carnivore, but during the summer months when the farmers market is overflowing with good eats I can't help but focus on veggies, fruit, and herbs. I put this pasta recipe together last week and have since made it two additional times. Did I mention that tomatoes are crazy good right now? That they are the candy of summer? It's true. If you like tomatoes then Disney World really is the happiest place on earth. Epcot in Florida has the largest tomato tree recorded by Guinness World Records. It produces a crop of 32,000 annually and weighs in at over 1000 pounds. Looks pretty neat, too. When I was reading about avocados and tomatoes, one site mentioned that they're "climacteric" fruit. According to The Google, climacteric means the fruit has a "cell respiration rise" and "accelerated ethelyne production" that causes them to go through a dramatic ripening stage after being harvested. When you stop and think about how food can just sit on a counter and transform from blah to delicious, it's kind of amazing. I feel so smart now. Avocados are also known as "alligator pears". That's quite accurate. California produces about 90% of the nation's avocado crop. Go, Cali! This recipe started off without the avocado. I roasted some cherry tomatoes, sautéed them with garlic, and then tossed everything with fresh parmesan, basil, and pasta. To be honest that combination is delicious as is. For lunch the next day I added chopped avocado to the cold pasta and thought, "duh". The aesthetic was a little rustic so my goal was to bring everything together into a more cohesive dish. 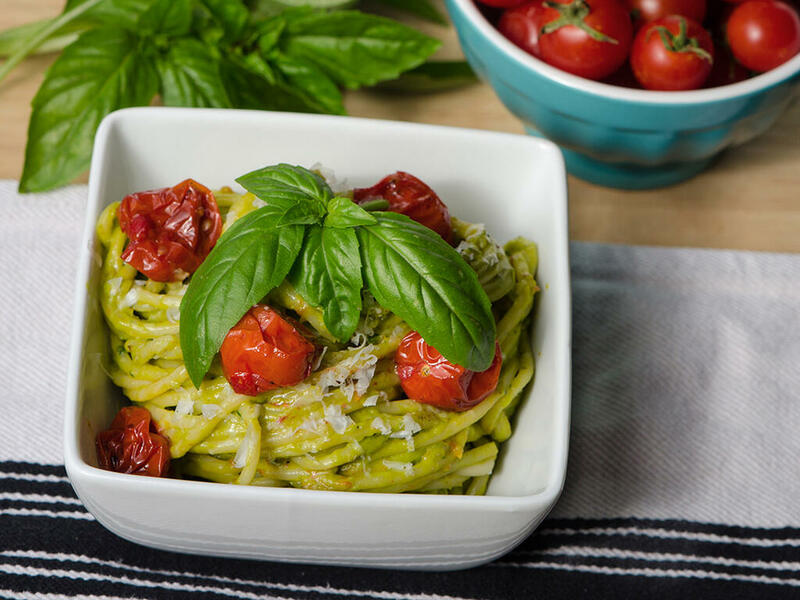 I went to Pinterest for ideas and found a few avocado pesto recipes that included raw garlic and pine nuts. Pine nuts can be a flavor bully so I usually substitute toasted walnuts, but avocados are so creamy and perfect that I dropped the nuts entirely. To soften the garlic flavor I used both roasted and raw. 1 pound spaghetti Note: I use thin or regular spaghetti, but not angel hair since it's too easy to overcook and doesn't hold up well in the refrigerator. Move an oven rack to the middle position and heat to 350. Line a baking sheet with aluminum foil and then lay a piece of parchment paper on top of that. Note: The parchment paper is important. Roasted tomatoes are delicate and even with olive oil they stick to foil. Slice about 1/4 inch off the end of your garlic (not the root end). It should look like this. Leave the skin on to hold the cloves together, rub the garlic with olive oil to prevent burning, and then seal it up in aluminum foil. Note: You will have extra roasted garlic for another meal or you can freeze it for future use. Remove any stems from your tomatoes. Set half of the tomatoes aside and then slice a tiny end off the rest. Note: I like to slice the tip off of some tomatoes so that they release their juices during roasting and in the sauté pan. 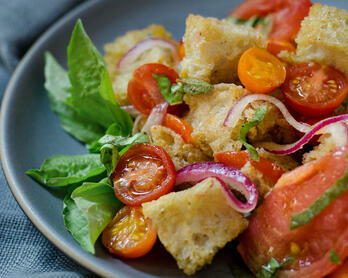 Transfer the tomatoes to the baking sheet and make sure they're in a single layer. Drizzle a generous amount of extra virgin olive oil over the tomatoes. I use my hands to spread the oil around, gently rolling the tomatoes to cover all sides. Pour some olive oil on the thyme. This will keep it from drying out too much. Scatter the thyme over the tomatoes. 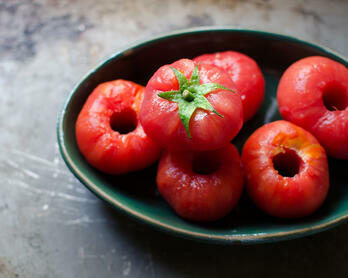 Sprinkle the tomatoes with kosher salt and fresh black pepper. Roast the tomatoes and garlic for 1 to 1 1/4 hours. Check on things in 30-minute intervals to make sure everything looks good. Your tomatoes should be wrinkly and slightly dehydrated (but not burned). Transfer the tomatoes and all of the juices (the juices are important!) to a bowl and set aside. When the garlic is cool gently press the cloves out of their skin and set aside. This is the point at which you can stop and put everything in the refrigerator in an airtight container. I often roast the veggies/fruit and then make my pasta the following day. Roughly chop 1/2 cup of basil and put in the food processor. Scoop the avocado out of its skin and put in the food processor. Pour off any oil/juice from the tomatoes into the food processor (not to exceed 1 1/2 tablespoons), add the lemon juice, 3 cloves of roasted garlic, and process until smooth. Note: Scrape down the sides once or twice to redistribute the pesto around the blade. Transfer to a bowl, stir in the 1/4 cup of parmesan, then add salt and pepper to taste. Mince or use a garlic press for the two garlic cloves. Note: I adore my garlic press. It's so sturdy, pretty, and easy to clean that I've actually given it as a gift. In a sauté pan heat 2 tablespoons of quality olive oil over medium heat. Add the garlic and stir around until fragrant. This will take 30-45 seconds. Add the cherry tomatoes and gently combine with the olive oil and garlic. Adjust the heat to low. The idea is to warm the tomatoes up, not break them down. You also don't want your garlic to brown. While the pasta is cooking, make a basil chiffonade for serving. Transfer the cooked pasta to a large bowl and for love of all things sticky don't rinse it. Add the avocado pesto and toss until coated. Add half of the tomatoes, any oil/juices from the pan, and very gently toss. 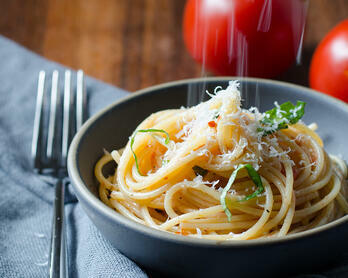 Portion the pasta into bowls, and then add the remaining cherry tomatoes to each serving. Note: Adding the tomatoes in two parts is purely an aesthetic thing. The tomatoes are delicate and break up a bit during the mixing process so I like to place some little guys on top. If this step is a nuisance go ahead and toss all of the tomatoes and juice/oil at once. Garnish with basil and freshly grated parmesan. Goat cheese works well with this recipe if you're into that sort of thing. Just sprinkle a little on top of the hot pasta. 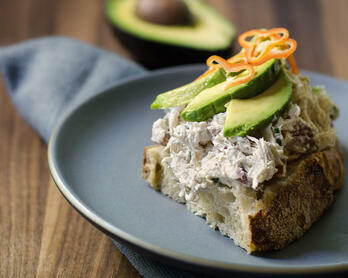 My preference is to add goat cheese to cold leftovers for a fast but delicious lunch. On that note, this dish is excellent the next day but I don't recommend pasta leftovers much beyond that for texture and quality reasons. Store in an airtight container in the refrigerator.